This next model was high on the priority list. 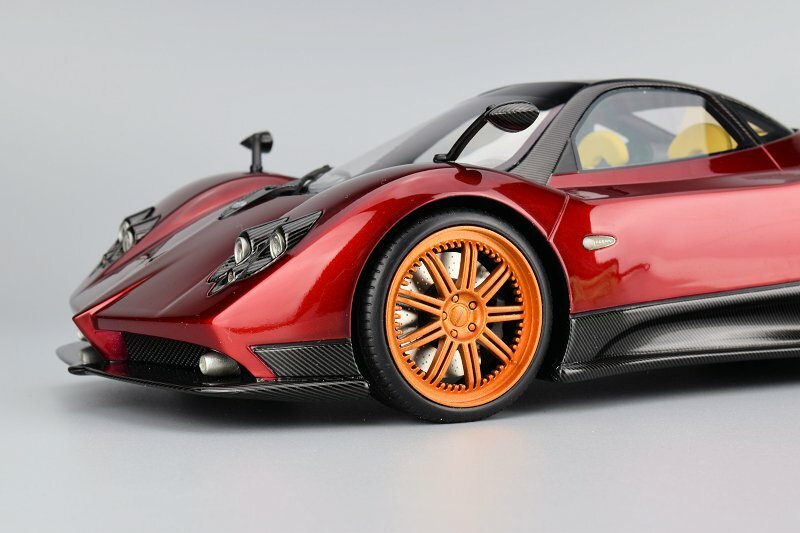 For one I love supercars, and the Pagni Zonda F is poorly represented in scale today. 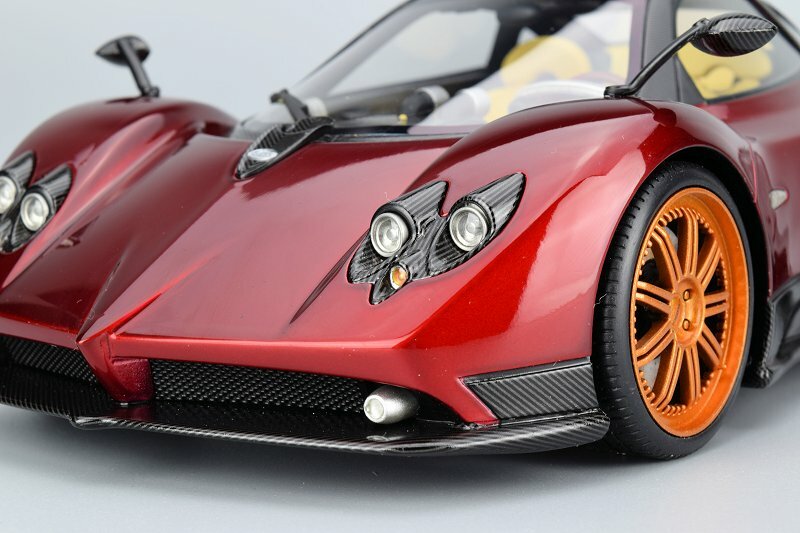 The model under the microscope today is the Pagani Zonda F in Rosso Dubi from TopSpeed models. Initial pre-production images of the car promised something speculator for a sealed resin piece. Fit, finish and colouring mirrored the original well. Unfortunately what made it to production comes short of the finish line. 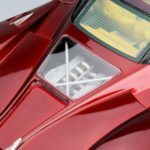 TopSpeed focuses on sealed resin models at a mid-level price point. 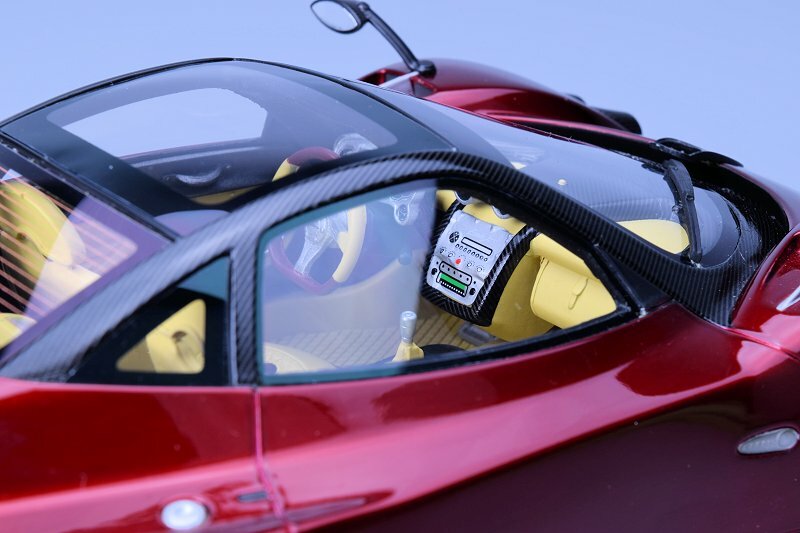 From an exterior point of view, the lines of the Zonda F are overall very good. Panel gaps and shut lines are on point, but as always that is given with resin replicas. The Rosso Dubi exterior paint is somewhat off from the production piece nothing huge but it does vary slightly. Also, the paint is somewhat thin around areas of the rear upper section. 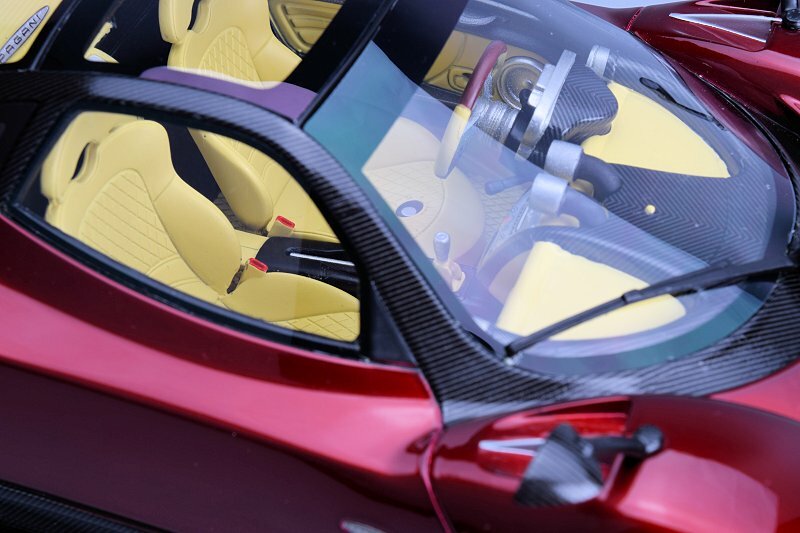 Carbon fibre work is very decent with a semi-gloss finish. 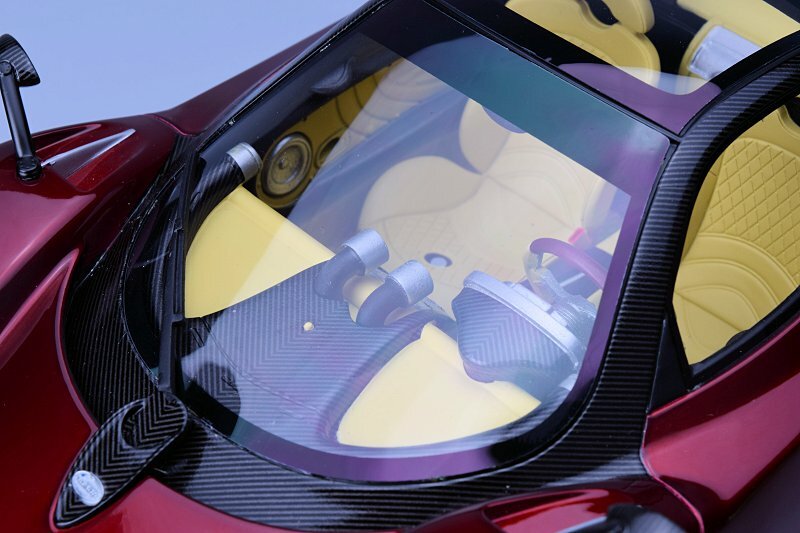 This is mirrored throughout the model, such as mirrors, headlights, lower sections and rear fin. None of the exterior small inlets provide perforated grilles just solid plastic pieces. 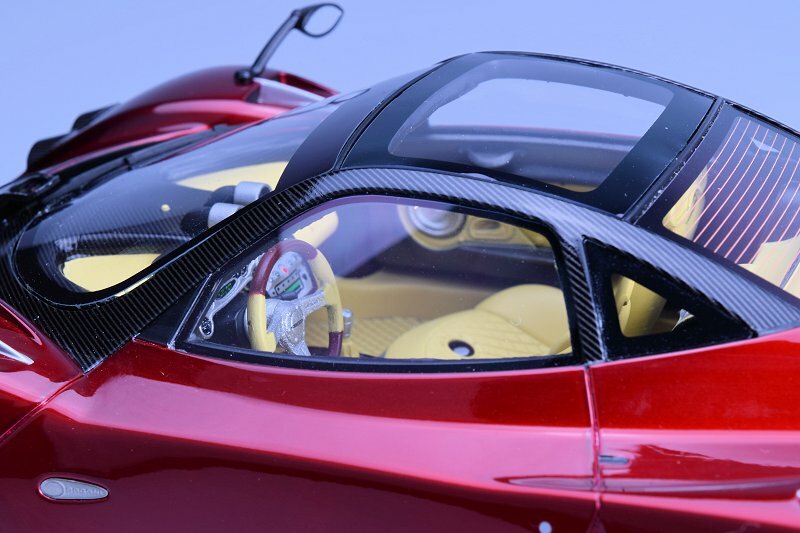 We do like the metal fins found on the Zonda F front and rear side, though quality control was missed on the front glass. 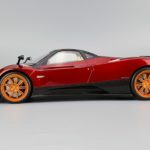 It is not seated properly on the driver side; creating a gap and paint chip on the passenger side front wheel area. Both should not have passed QC. 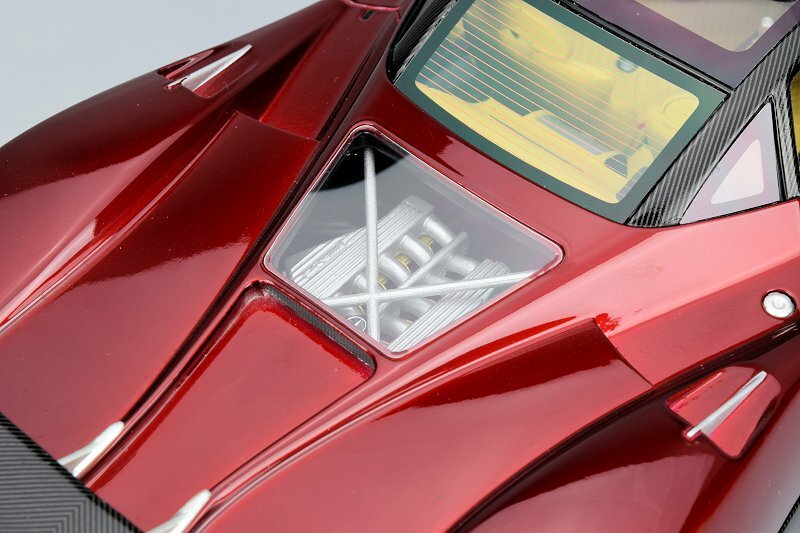 The front section of the model features the cool carbon fibre headlight housing. The execution here is very good along with decent materials for a high and low beam with turn signal lights. Though the lower beams incorporated in the lower section of the bumper are poor in comparison. Lower intakes are once again completed with solid plastic pieces. Boo! 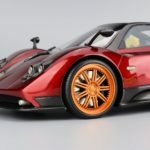 The rear of the Zonda F is where the heart lines, but what you are faced with is a large piece of solid plastic once again. Huge disappointment. 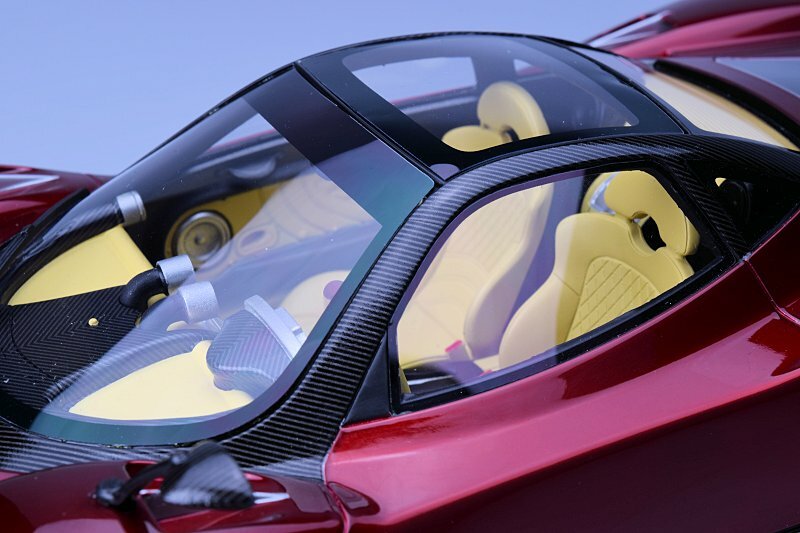 Carbon fibre work here is once again on point. The rear lower diffuser is well done. Average to above average marks to exhaust elements and taillight trio. There is a small area of the engine exposed to view. 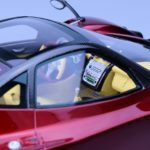 TopSpeed’s choice of replication is something average and lacks realism. 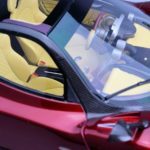 There is some colouring here along with carbon fibre work and Mercedes-Benz badge, but the total package as stated leaves you wanting more! Wheels, for the most part, are executed well. This includes the scale, rotors, and calipers. The big miss here is the paint finish, it is completely wrong! The finish is much lighter and more welcoming in reality. How this made it through into the production model is a mystery to me. Pre-production was more on the mark. 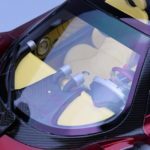 Inside the cockpit of the Zonda F is very good, better than I would have anticipated. 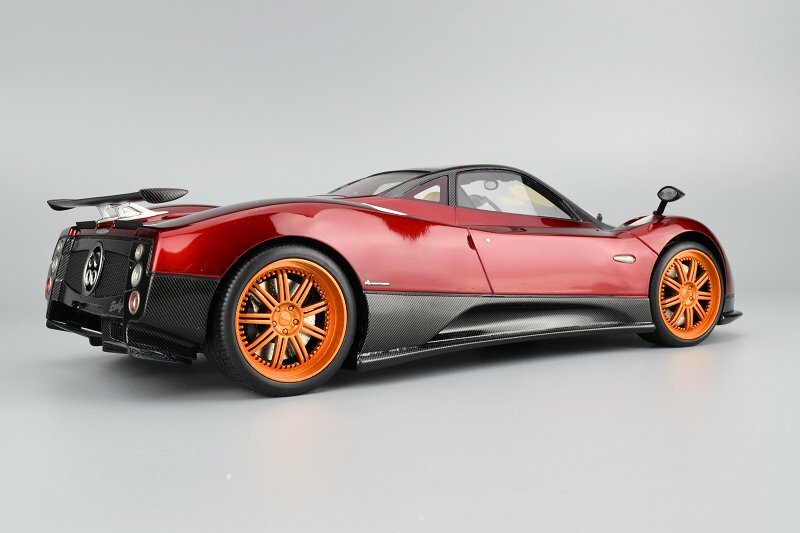 Full marks for the use of colour and decals to create something more visually appealing and in line with the traditional Pagani bling. This extends into the doors and rear section. There is, however, one big miss. Where are the seat-belts? They were presented in the pre-production model but nothing is found here. WTF! 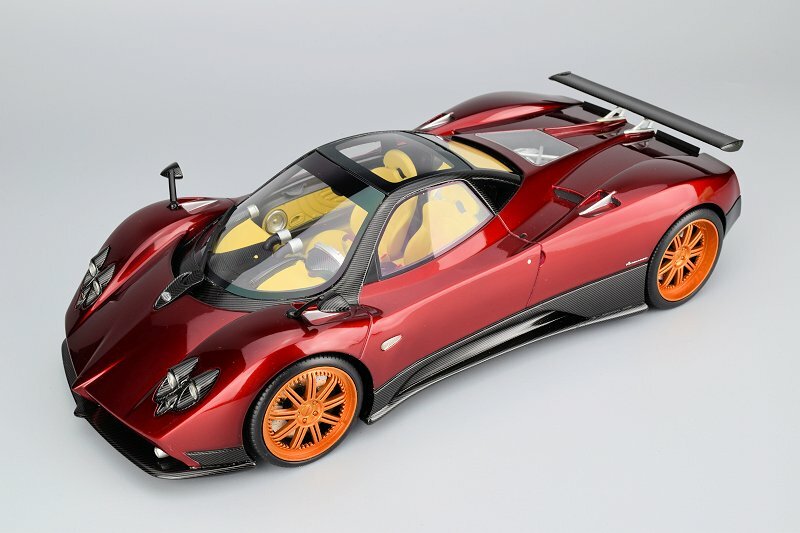 It’s a mixed bag of emotions with the TopSpeed Zonda F. There are some highs, but more lows with this model. Overall I say this missed the mark here. Some much potential to hit a home run, but the team may have rushed this one to market too soon. Again I will reiterate these words to TSM/TopSpeed. Do you want to gain market share? Then follow these simple suggestions. Do away with the massive wood base. This and reduction of box size will reduce overall cost. Use these saving to complete the exterior. I mean use perforated pieces wherever you can to elevate the end results. Action these simple ingredients and gain market share! 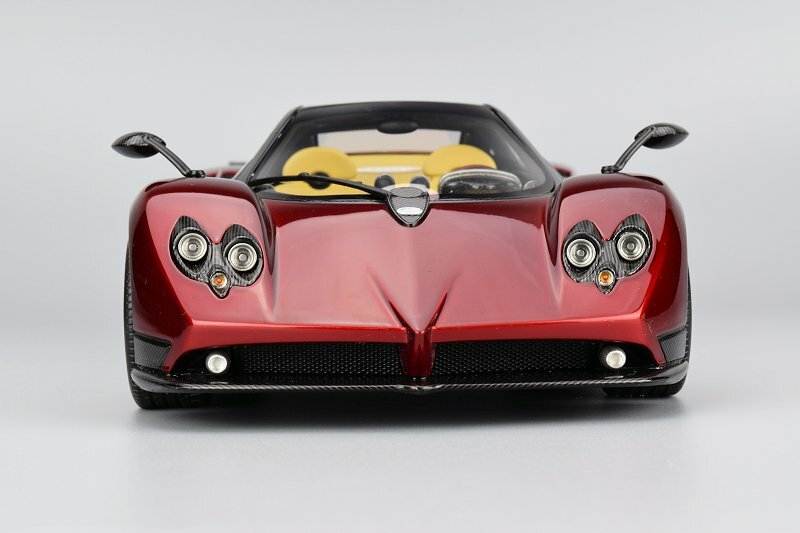 On the flip side, you compare to what is available in scale today we have the diecast version from Mondo Motors. Now if you own one (I do) you know it is very poor. 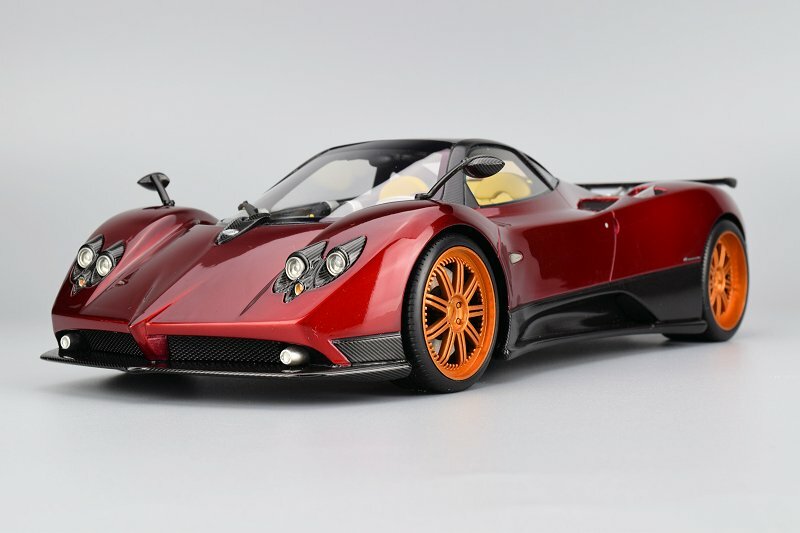 So if you’re looking for a replacement the TopSpeed replica is definitely more a refined piece. Enjoy the pics! 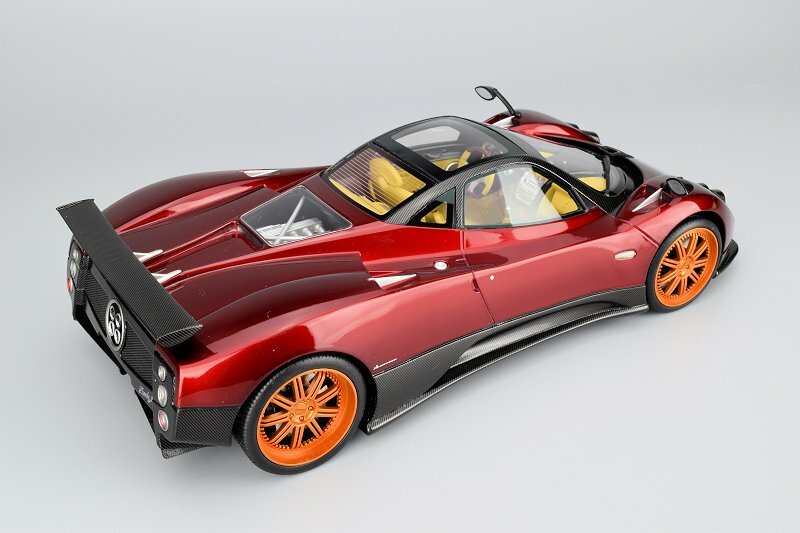 7 Responses to "REVIEW: TopSpeed Pagani Zonda F"
Huge opportunity wasted here. 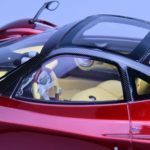 Hopefully Top Speed heed the feedback from the community and the follow-up silver version corrects the fails from this one. Time will tell. 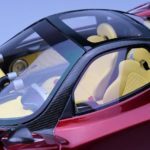 In my opinion, it is a completely pointless waste of money, because the model is in the plans of Almost Real. Top Speed made it like some degree of toy, misrepresenting the shades of wheels and interior. 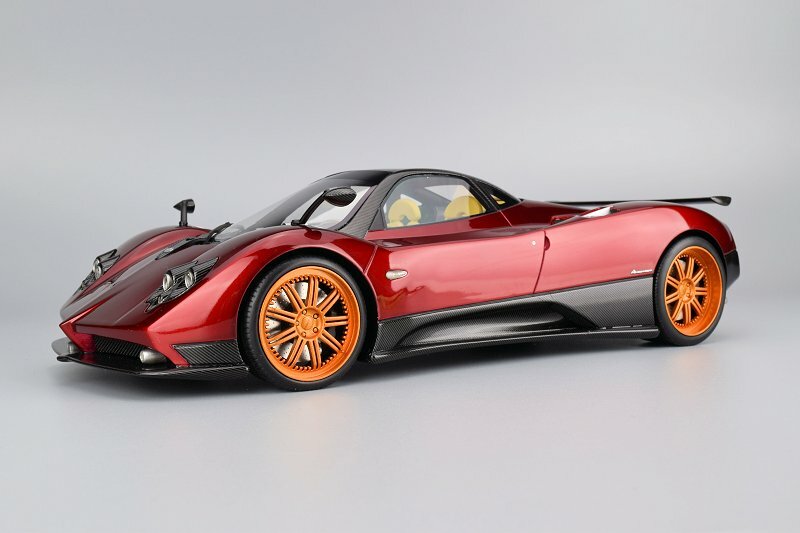 Waiting for Real Zonda Tricolore seems the right thing to do. 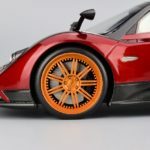 That wheel color is gross!! 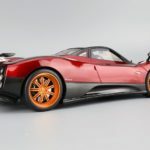 A representative from TSM has contacted me re-guarding the change in paint / wheel color of this model and said that Pagani themselves has denied TSM from using that original paint scheme on this model. This is why the colors from this model are different from the one originally shown in pre-production stages. That is utterly ridiculous! I can’t except this answer. Why would a 1:1 manufacturer intentionally sabotage a representation of their own creation!